Shut-Off Devices | TROX Malaysia Sdn Bhd. Trox multi-leaf volume control dampers have been specifically designed for use in ventilation systems for volume, flow and pressure control. In addition, the type Cs with side and tip seals satisfies the closed blade leakage requirements specified in UL 555S Class II. Type VCD dampers are available for square, rectangular, circular and flat oval ductin. The casing is a rigid and robust assembly formed from either channel frame for flanged connection to duct work or top hat section for spigot style connection. The blades are formed single skins with grooved blade tips to provide interlocking closure. Blade action is as standard parallel but can be optionally opposed action. Blade tip seals can be fitted for low leakage applications. 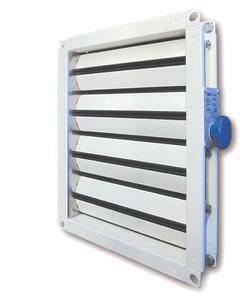 The dampers can be fitted with hand locking quadrant or can be operated by electric actuators. 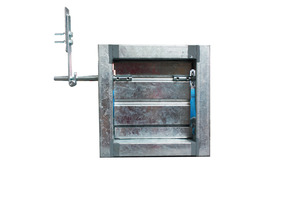 The damper casing and blades are made from 1.5mm thick galvanized steel sheet. The blades are fitted with 12 mm diameter mild steel spindle in zinc plating. The blade spindles are connected to the damper casing with bearing journals which have a maximum operating tamperature of 80 °C. The damper has face linkage with parallel blade arrangement. Counter-weight arm(s) is fitted to the side of the damper casing complete with adjustable weights, located outside of the air stream. The blades are fitted with tip seals made of Silicon rubber. 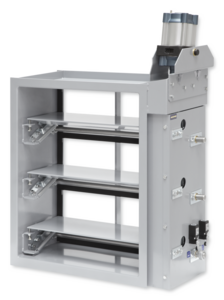 The SLC dampers can be operated either manually with a hand locking quadrant or, automatically with the aid of electric actuators. Standard construction of the SLC damper is available with 30 mm wide flanges in all four sides. The SLC dampers can also be supplied with either rectangular, square or circular spigots. The SLC dampers are also available for low closed blade leakage using the applications C2 variant.